A TTORD Gateway Login is automatically published when the login has an account or is mapped to one or more Direct Traders. The Publish to Guardian option is available from the File menu if TT User Setup and Guardian become out of synch (a message appears if this occurs). Note: Because publishing sends data over the trading network, which could impact trading performance, TT recommends avoiding or limiting publishing during trading hours. TT User Setup only - A gateway login exists in TT User Setup, but not Guardian. For example, gateway logins have been added to TT User Setup, but have not yet been published to Guardian. Guardian and TT User Setup - Changes to a previously published gateway login have been made in TT User Setup but not published to Guardian. Guardian only - A gateway login exists in Guardian, but not TT User Setup. For example, gateway logins have been deleted from TT User Setup, but have not yet been deleted from Guardian (by publishing). The Publish to Guardian window appears. Highlight the records you want to publish. 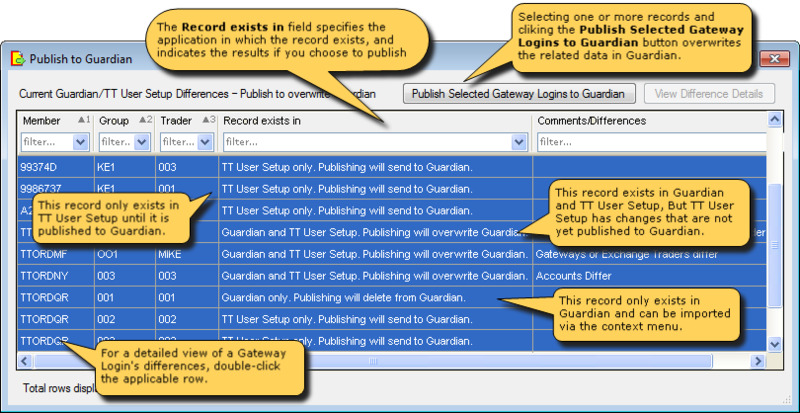 Click Publish Selected Gateway Logins to Guardian. The following image specifies the records that require publishing. Note: TT User Setup includes an optional server-side setting, DisableProductLimitPublishing, which causes TT User Setup to disregard all changes that are not related to order routing when checking for differences between Guardian and TT User Setup. Order routing data includes TTORD to exchange trader mappings and TTORD account numbers. This option must only be used with FIX Adapter 7.6 and later when all traders who are risk checked in the environment are using X_TRADER 7.8 or later. For a detailed description on disabling product limit publishing, refer to the TT User Setup System Administration Manual.